You are most welcome to visit us on Mondays at 7.45pm (for 8pm start) from September to May. No advance notification is necessary but do please introduce yourself to a Committee Member so that we can make you feel welcome – no-one enjoys Lonely Visitor syndrome! Click here to see a map of the Amersham Community Centre rooms. Digital, Monochrome, Colour, PIC and Member Development (formerly Camera Craft) groups may meet in other rooms on the site – see the calendar and each specific group’s web page for details. Why should I join Amersham Photographic Society (APS)? APS has been developing and encouraging photographers for nearly 70 years and our membership comprises men and women of all ages and backgrounds. New members interested in the art of photography are always welcome. You can join us throughout the year; it’s not necessary to wait until the start of the season in September. Our general meetings are on Mondays; our season runs from September to May. Special interest groups meet on a different weekday evening at monthly intervals. See the Programme and each group’s web page for details. Together with the special interest groups, APS offers an unusually wide and attractive range of activities for photographers. For beginners, the visiting speakers and events are always an inspiration and our optional competitions (in Prints and Projected Digital Images) are a great place to see the latest photographs and hear constructive criticism from trained judges. The Digital Group provides training in Photoshop Elements and advice in the process of achieving successful images that communicate well to the viewer. Similarly, the Monochrome Group provides expertise & advice for those wanting to work in Black and White. The Colour Group is a recent introduction, recognising that many photographers prefer working with colour images. Our Photographers in Camera (PIC) group encourages & supports photographers wishing to work thematically. This expert-led group has official recognition and support from the Royal Photographic Society. Member Development (formerly Camera Craft) provides hands-on guidance in various aspects of camera use & special techniques – ranging from real beginners subjects, through to advanced techniques. Outings – in addition to the regular meetings, we have informal and sociable outings to places of photographic interest. 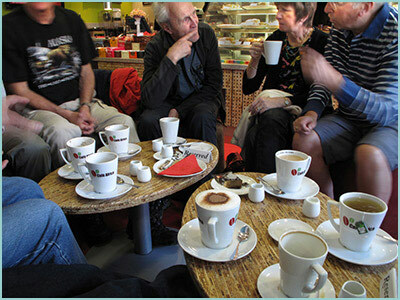 Café Africa, in Chesham Road, hosts an informal APS get-together on Wednesday mornings, throughout the year. Experienced photographers who join us will be challenged by the exceptional standards of our advanced members, many of whom exhibit and win awards at national and international level. As a club, APS has regularly been in the top five in the UK and reached the pinnacle in 2007 as the top UK club for prints. In 2015 we won the prestigious Photography News ‘Camera Club of the Year’ competition. Success with us is a stepping stone to the highest level of amateur and semi-professional photography. Membership and membership renewal form (it’s the same form): PDF or Word document. In addition to the Society’s annual subscription, there is a small annual fee, currently £10, for membership of the Photographers in Camera Group (PIC). Some other activities may require a fee which will usually be declared beforehand. Visitors and members of other clubs are welcome to join us on occasions when we have an outside speaker. For this there will be a charge of £5 per person, except for our special speaker events for which we usually announce a higher charge as appropriate. Each year, for three days around the end of August, we exhibit our work, prints and projected images in Amersham. Entry is free to all. This is a great way for us to show to the public what our members have achieved in their photography. Every member is invited to enter examples of their work, none of which will be competitively judged. There’s just not enough time on a Monday night to chat about our photographic exploits and challenges, or to get to know the people behind the faces. There’s a more relaxed opportunity to do this at our weekly morning get-together over coffee. Every Wednesday morning throughout the year the venue is Café Africa, Chesham Road, Amersham on the Hill, from 10am onwards. Café Africa location map. We’d love to see you. All our members are welcome. No prior notice is needed. When the season’s formal programme ends, there are very informal sociable gatherings on Monday evenings in the Community Centre Bar. These take place from 8pm onwards during June, July & August. It’s a relaxing opportunity to chat about your photographic adventures, show your holiday snaps and your competition winners, or just get to know the other people there. Everybody is welcome. No notice needed. Just turn up.